NKB 200cc/68cc ULTRA HIGH FLOW CYLINDER HEADS WITH PBM COMPETITION VALVES STRAIGHT PLUG, FOR SBC CHEVY 327 350, 355 383, 400, 406 ENGINES. Setup for hydraulic flat tappet cams. 200cc RUNNERS, 68cc COMBUSTION CHAMBERS. This ad may have references to pictures and graphs that are not visible in the description. To see this ad in it's complete form click the "buy it now" tab. This will not in any way commit you to buying the product. It will bring you directly to this ad in its entirety on our actual website. You will then see the ad displayed with all the pictures and dyno graphs throughout the ad. in great detail. THE BEST FLOWING, BEST QUALITY SBC ALUMINUM HEADS ON THE MARKET FOR THE MONEY. This sale is for one fully assembled set of heads (2 heads). The springs in these heads are set up to operate with hydraulic flat cams up to .535 lift. For those running hyd. flat tappet cams, see our other listings. The NKB aluminum heads have 68cc combustion chambers with 200cc runners, 2.02/1.60 stainless valves. These heads are not built by Procomp, and have no association with them in any way. These heads will accommodate conventional style carburated intakes as well as Vortec (96-up 5.7) style intakes. The heads will not work with pre-Vortec, (87-95) tbi intakes. Our cylinder heads are made from AC4B alloy and tempered to T6 standards. Details about this alloy are in the lower section of this ad. These NKB heads have 68cc combustion chambers. The valves in these heads have been upgraded to our Premium PBM race grade valves. These are custom built NKB-200 aluminum heads with 200cc runners, and 68cc combustion chambers, 2.02/1.60 PBM stainless competition valves, 1.46 diameter dual roller springs. These heads are not built by Procomp, and have no association with them in any way. The main reason to use a 68cc combustion chamber over a 64cc size is to reduce static compression. For those building a 383 engine setup with flat top pistons for street rod use, this is the perfect combination. The 68cc heads, coupled with the flat top pistons in a 383, will produce right at 10.44:1 compression ratio, assuming your pistons are around .005 in the hole. If your pistons are at an optimal zero deck ht., then compression ratio would be 10.56:1. with the 68cc heads. These numbers are ideal and reasonably safe for any pump gas 383 street rod. If you were to use the 64cc heads with the same flat top pistons, (.005 in the hole) your compression ratio would be 10.91:1, and if at zero deck ht., 11.05:1. Those numbers are on the high side, and depending on other factors, could put you in the danger zone for detonation. If you're calculating your piston to deck ht. at numbers beyond .010 or more, then your overall compression would be lower, but this not the way to build the engine with pistons sitting so low in the block, as the quench/squish zone is very poor to say the least. You should have your block at zero deck ht, (pistons set flush with the deck of the block). 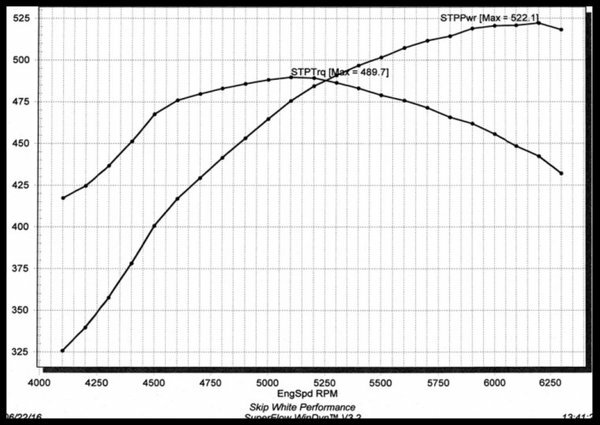 There are few if any 383 street rod builds that require compression in the 11:1 zone, especially if you're running a pair of heads that have 200cc runners and a cam under 580 lift. Recommended accessories for these heads. Please see our other listings. Spark plugs. See Important Note. For those running an HEI distributor, the plug gap should be approx. .040-.045 Those running an MSD 6AL unit should gap the plugs to approx. 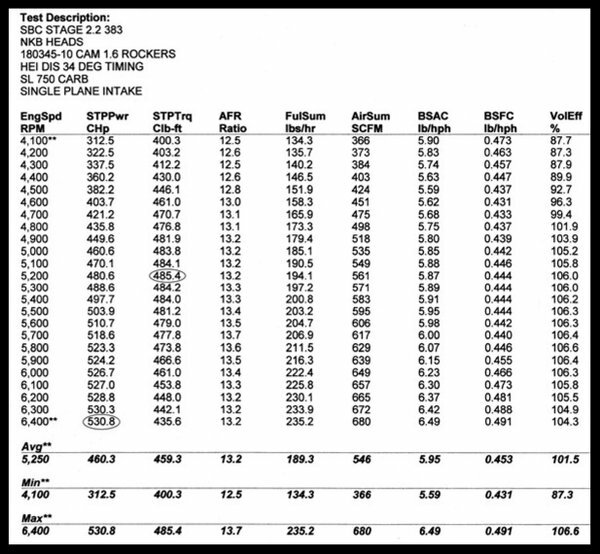 .035-.040 These values are very controversial and you may experiment as to what runs best in your engine. Widening the gap too much can put a strain on the ignition components. Be sure your plug wires are completely fastened onto the spark plugs. We certainly know where to draw the line with low end products, and we continue to eliminate parts that we once accepted but that eventually had problems. Sometimes it's not that a particular product has had a problem that leads to its elimination; something better just comes along. The NKB cylinder heads are that "something better" coming along. Considering the price is only slightly higher than our former line of heads, this has to be the best value in a set of cylinder heads we have ever offered. We now use the NKB heads on all of our 350, 383, and 406 engines. The performance has been outstanding on every combination we have tried them on. In the rare event you have issues with our NKB-200 heads, the problem will be addressed. As of today (2/17/16), we have been selling the NKB heads for around 2.5 years. We have sold approximately 3500 sets, and problems have been near non-existent. We have complete top end hardware kits available for the NKB-200 heads in our other listings. The kit has the correct head and intake gaskets, head bolts with special washers, and stainless intake bolts. The part number is TEK-1003-1206, or for those that favor the MLS multi layer style head gaskets, part number TEK-5219-1206, or any TEK kit that has the 1206 part number in it. The first number is the type of head gaskets, and we offer around 5 different head gaskets that will work with the NKB heads. The 1206 is the intake gasket part number, and that is mandatory for use with the sbc NKB heads. If you are using an Edelbrock Performer EPS intake then you will need to use a 1205 intake gasket instead of the 1206. This is due to intake flange not covering the top of the 1206 intake gasket properly. The 1205 is slightly small for the NKB heads, and may need a very slight amount of trimming to avoid any gasket materiel hanging over into the intake runner. We have been through this procedure in our engine room many times for engines using the Performer EPS intake. These heads are also available in angle plug style, and with steam holes. Please note: Due to a high volume of sales at this time, these heads may take up to 2-3 business days to complete and ship. Please let us know if you are under a time constraint with this order, and we will do our best to accommodate your request. A breakdown of the part number. The NKB stands for "New Kid on the Block"; 200 represents the runner size, 272 designates the use of 100 long valves, and single springs with a damper setup for hyd. flat tappet cams. You will also see the heads listed with the number 274. The 274 designates the use of 200 long valves with dual springs with a damper, setup for hyd. roller cams. We also have the valve train setup for solid roller cams, and will have the number 583 rather than 272 or 274. The heads listed with the letter "A" in the part number are angle plug design. We also offer these heads with steam holes for GM 400 blocks. These will have the letters SH (Steam Holes) in the part number. Be absolutely certain of what you need before buying. Feel free to call us if you need assistance deciding what you need for your build. Heads with PBM at the end of the part number have our premium race quality valves in them, and are only available in the 68cc combustion chamber size. Any of the NKB adds without the letters, "PBM" in the part number will have 64cc combustion chambers. Any of the NKB heads we offer can be setup with PBM valves, but do understand that these valves are what make the 64cc heads into a 68cc chamber size. The PBM competition valves have a concaved face that is much more prominent than regular valves. This increases the combustion chambers size. See our other listings for these heads with 64cc combustion chambers. Our NKB-200 heads have been designed especially for us. After receiving many recommendations from our engine builders, we came up with the best quality, best flowing heads on the market relative to cost. The only way you're going to get a set of heads that flow as well or better will be to spend at least double the cost or more. We have installed these heads on all of our 383 and most of our 406 engines for the past 2.5 years. Many of these engines were dynoed on our Superflo dyno. The engines had every possible combination of cam, intake and carb. The results have been amazing. These heads are excellent in design and quality. Our choice of hardware and precision assembly also contribute to the performance and reliability of the heads. These heads can be used with outer perimeter or center bolt valve covers. Below is our flowchart on several different heads. All tests were performed on a Superflo 1020 bench by our expert head builder. We stand behind the accuracy. We have noticed many other sellers posting what we consider to be false flow numbers on the heads they are selling. We find this to be nothing short of outright fraud. Of course, flow numbers can vary a few points depending on equipment used and testing methods, but not by 15-25 points. Notice the low lift flow numbers produced by our new heads. That is as important as the upper lift numbers, and it's why these heads produce so much peak power and torque. We are very impressed with the flow numbers of our new heads. In the flowchart above, the NKB-200s are superior to the Procomp heads in flow numbers, and also edge out the Dart SHP heads on the intake side. The intake numbers are far more important than the exhaust. The overall average flow numbers on the NKB-200 heads are higher than most any brand of non cnc'd cast aluminum heads on the market. We guarantee the flow numbers to be accurate, as well as the horsepower numbers produced by them. Most importantly, all three of these heads were tested by the same person, on the same machine, (Superflo bench 1020) using the same testing method, on the same day. These numbers show the true difference between each brand, and that's what counts. The difference in horsepower and torque generated by these new heads is monumental compared to the Procomp heads. We offer four different cam choices with our 383 and 406 engines, and every combination has shown an increase of up to 50 horsepower and no less than 40 hp when coupled with the various combos. We assumed the new heads would generate a considerable increase in power, but to our surprise, they generated even more power than expected. We tore down the heads that were on our 383 house engine and checked the guides as this was an area we are most concerned about, and found zero wear. The seats were also in perfect condition. We tested the spring pressure to see how much was lost after a brutal 80 or so dyno passes, and saw approx. 5 lbs of pressure drop on the nose, and even less on the seat, and this is to be expected. Many of the dyno passes were run to 6500 rpm as the large cam needed 6300-6400 rpm to make peak power, and you must run past this to determine the fall off point. The super sized cam (choice 1) was run on the heads towards the end. Considering the size of this cam, it was very impressive to see zero issues with the heads or hardware. We made a good 25 passes with the big cam trying out different carb sizes, jetting, intake manifolds, timing setting, and adding the Super Sucker plate last. The two paragraphs above were written a couple years ago. We have now sold several thousand sets of the NKB heads. To this date we have had no problems of any kind with them. ONE YEAR WARRANTY, UNLIMITED MILEAGE. Here is a rundown on the hardware used in these heads and the assembly process. Melling High Performance Dual Springs. Our Melling springs are 1.46 diameter, with an inner spring and internal damper. Others are using springs that are much smaller in diameter. 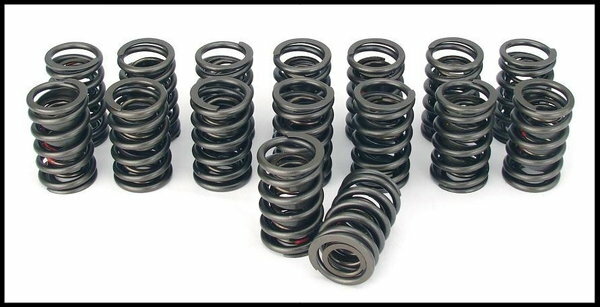 Smaller diameter springs may be in the correct spring pressure zone, but they usually have a shorter life. Melling springs are made in the USA. All of our engines using the NKB heads use these springs. Spring failures are near non-existent. We also offer a low cost spring upgrade for these heads. This upgrade will use our Comp 987-16 springs. These springs will allow the use of valves with a .100 shorter stem, and this creates a better valve train geometry in our opinion. The Comp springs have what we consider a better seat to nose ratio, and are 25% lighter in weight. The Melling springs are a decent spring, but the Comp has several factors what make is well worth considering. Our valves are high temp stainless steel. PBM/Erson stainless steel valves, swirl finished one piece undercut, the same valve we have used for years. Our cost on these valves is nearly double the price of some low cost valves on the market. These are made from high grade non-magnetic stainless. We know for a fact that many head builders use the low cost valves. It is very rare we ever encounter a problem with our valves. 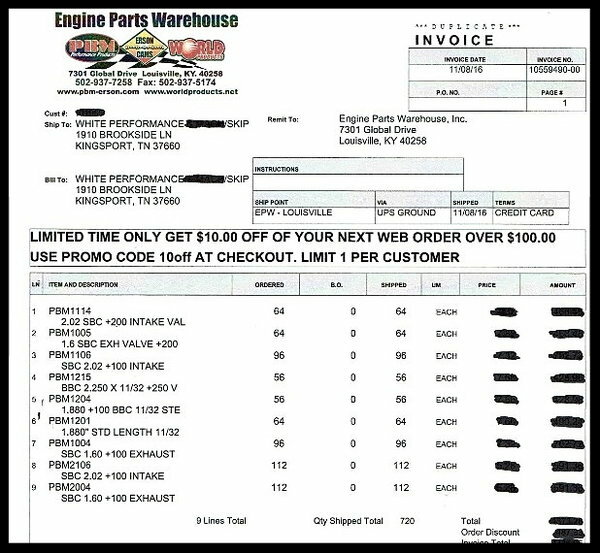 Below is a copy of one or more of our invoices from Engine Parts Warehouse showing a recent large order for our PBM valves. We have removed the price and our account number for privacy reasons. This is the best way we can prove to our customers that the valves we use in our cylinder heads are genuine PBM products. Comp 10 degree machined valve locks. We use only Comp Super 10 degree machined locks. Our head builder noticed the low grade locks on the market fit more loosely than he felt they should, not to mention the possibility that they were made of inferior metal. He envisioned the engine being much more prone to dropping a valve at high rpm. Using these locks, we have yet to have an engine drop a valve due to a valve lock failure. Our Comp Cams retainers # 75740-16 and Comp ID locators # VTH-4771-16 are made from 4130 chromoly steel. These retainers have a perfect fit with the Comp valve locks. We have used these on all of our engines for many years, and have had zero failures. We hone all of the bronze valve guides with a ball berry flex hone to establish not only perfect clearance, but also a semi cross hatch finish for oil retention. We finish off with a natural bristle brush. The heads are then placed in our parts washer and cleaned with high pressure hot water, then pressure dried. Before installing the valves, we apply a heavy coat of engine assembly lube to the valve stems. The coating on the valve stems is essential to protect the bronze guides from gaulding on initial startup. Our next step is to set the spring pressure to a predetermined pressure using a spring height checking device, most suitable for street rod use. The springs we are using allow for a near perfect seat to nose ratio. Be warned that some sellers of aftermarket heads may not be checking the installed height when assembling the heads, and may not be setting them up to the correct pressures. We have a full scale machine shop with several very knowledgeable engine builders that know and fully understand how to properly assemble a set of heads. Combine the possibility of poor assembly methods with incorrect or low grade hardware, and it is easy to see how failures can result. We purchase most of our valve train hardware in bulk for our engine program. 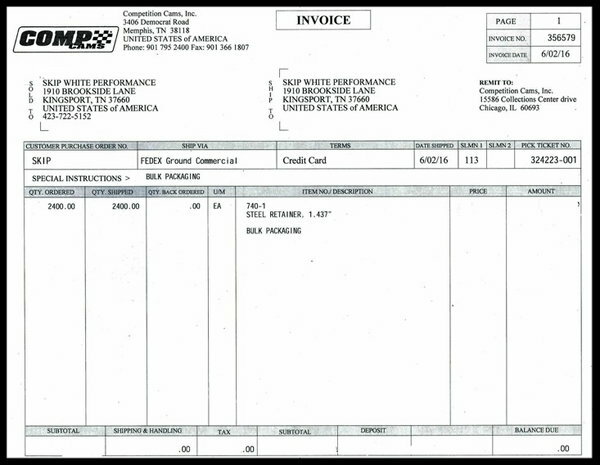 Below is a copy of one of our invoices from Comp Cams showing several of our rather large purchases of valve train hardware. We have removed the price and our account number for privacy reasons. This is the best way we can prove to our customers that the valve train products we use and sell are genuine Comp Cams products. IMPORTANT NOTE CONCERNING ROCKER ARM STUDS. If you have been a regular shopper with us, you will have noticed we do offer some knock-off products that are made off-shore. We do also sell many products made in the USA. We have always been very particular as to the quality and workmanship of such products, while considering the cost. We scrutinize our products very carefully and refuse to sell products that simply don't meet our standards. We have now eliminated another of the low cost knock-off products from our line. The low cost imported rocker arm studs have shown numerous problems unlike those in the past. We have looked at several others on the market, and still find many issues with them that are not acceptable. Many of the studs had run-out in the shaft of up to an eighth of an inch. This caused major problems with rocker alignment, and depending where the position was when the stud tightened up, would determine the direction of the rocker misalignment. If the warped stud was facing toward or opposite the valve, then the roller tip would would not be centered to the valve tip. This would then create a loss of lift and cause increased wear on the valve tip. If the warped stud tightened up in a side to side position, then this would allow the rocker tip to be cocked on the valve tip. This would then side load the valve tip with undue pressure, creating a serious wear problem on the side of the valve tip and create excessive wear on the valve guides in the heads. This also side loaded the rocker trunnion and front roller, creating an excessive wear issue in the roller rockers. We also found a difference in the tread pitch and depth compared to the ARP studs. The rocker studs in an engine are under a tremendous upwards pull and improper thread design may cause the studs to pull out of the head. The ARP studs screw into the heads with a very precise fit and feel. After thoroughly comparing the ARP studs and several off shore models, I am convinced that we will never offer the off shore studs again, regardless of the price difference. They were never as bad in the past as what we're seeing now. This run-out was most likely caused by improper heat treating methods. We are aware of only one other rocker arm stud besides ARP on the market of decent quality, and that's from the GM Performance division, and it's fair to say they are most likely supplied to GM by ARP under private label. We have rejected many products that are outright junk and would cause serious issues in your engine only to see other sellers offering those same exact products. It's all about learning where to draw the line. Studs and guide plates are NOT included. Other sellers may include these items but rest assured, they are usually not suitable for these heads. We use nothing but the Dart adjustable guide plates and ARP rocker studs when we build an engine using these heads, as they allow for perfect alignment of your rockers. See our other listings for a full selection of accessories. See our other listings for valve train related items that you may need for your project. 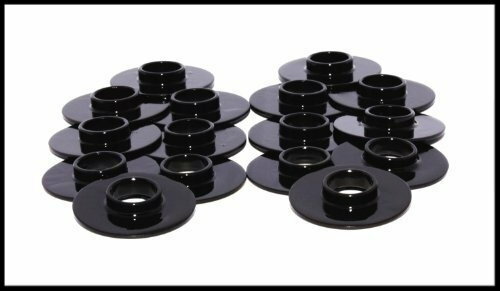 The part number for the correct studs and our Dart guide plates to be used with these heads is 38-GP for those running 3/8's size roller rockers, and for those with 7/16's roller rockers the part number is 716-GP These kits are available in our other listings. We are glad to offer many great low cost items, as well as the high end products, but will always give careful consideration to quality, functionality, and overall value. We have noticed several sellers offering these heads with a one size fits all valve springs for dual use on hydraulic flat tappet and hydraulic roller cams. We are sure this is not the proper way to setup the heads. If they have this one size fits all setup somewhere in the middle spring pressure values of what is required for a hyd. flat tappet and a hyd roller cam, then it would be too much for the hydr. flat tappet cam, and create a wear issue. Putting too much pressure on flat tappet cams is a sure way to kill the cam. If these middle of the road springs were used on a hyd. roller cam, then the spring pressure would be too low. Valve float and its damaging effects, along with a loss of performance, are sure to occur. We use the correct spring for your setup and it is never the same on a hyd. flat tappet as it would be on a hyd. roller cam. As mentioned above, the spring requirements between a roller cam and flat tappet cam are dramatically different. Even the odd ball solid flat tappet cam has its own unique setup depending on the lift. The one size fits all hardware claims also to work on these cams. We know of several sellers offering this insane setup to unsuspecting buyers, and it's not the proper way to set up a set of heads. We would not even consider using a spring setup like this, and believe me, the simplicity of it is appealing. 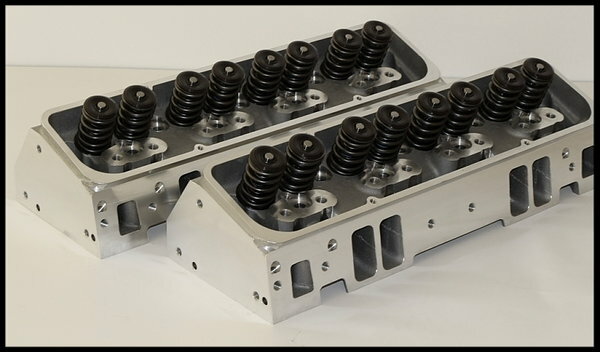 Our cylinder heads are made from AC4B alloy and tempered to T6 standards. You may have heard the alloys 355 and 356 being used on many heads. The alloy used on our heads is similar but slightly different. The AC4B alloy is commonly used by automakers in Europe and Japan. Take notice of the Rm value. This value indicates the tensile strength of an alloy. As you can see, it's higher than all the other common alloys in this chart. It's no surprise as to why we have never experienced a failure of any kind with these heads. Zero failures in the casting, zero failures in the seats and guides. We have sold over 5000 pair of these heads over the past four years. The results produced by these heads will vary greatly depending on the type of setup you are running. The engine combos we have dynoed are what most people use for cam and intake selection, and the results are listed below. The engines dynoed were many 383's, and several 406 cid engines in the 10:1 to 11.2:1 compression range. All ran on pump gas. Our Stage 2.2 383 engine ad has a selection of four different cams. I have copied this info from that ad. This will give you an idea about the capabilities of these heads with combinations of cam, intake, rockers, and carb. 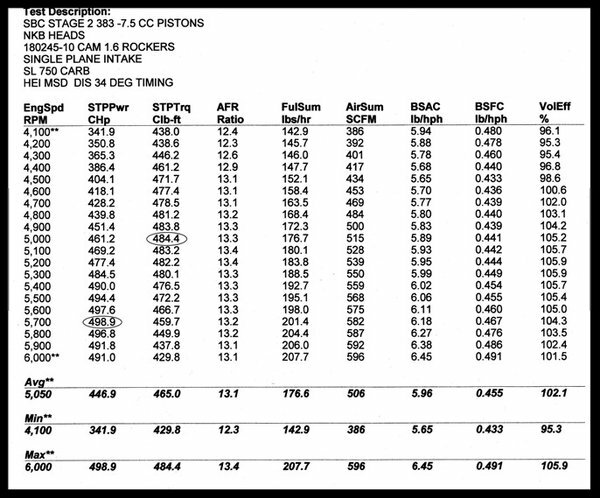 This may also help you select the proper cam for your build. As mentioned, below is just an excerpt from our Stage 2.2 engine ad. We also built and dynoed a 350 engine recently with the new NKB-200 heads for a customer, and will have the actual dyno results in this ad soon. The cams mentioned below are all hyd. roller cams. If you're using a lower lift than those listed below, then it would be fair to say the hp will drop, but not by much, providing your lift and duration are somewhat close to any of the cams mentioned below. This will give you an idea of what kind of power to expect with these heads, and it can certainly help you choose a cam and intake. Please do understand that a cam is not included with the heads. This is just a guide to show what you may expect with a given combination when building a 383 engine using the NKB heads. PART # 186755-10 This is a hyd. roller cam for use with OE roller blocks only. PART # 116755-10 This is a retro style hyd. roller cam for use with non roller blocks. Recommended springs #: 274, See our other listings. This cam choice # 1 is very aggressive in the 383 Super Stroker engine. We have not offered this cam in the past with any of our 383 engines. This is the same cam choice used in our 421/427 engines. The reason we decided to try it in our 383 Stage 2.2 was to see what the max potential was with our new NKB-200 cylinder heads. We pumped up the compression a bit with a flat top set of pistons, topped it off with a set of 1.6 rockers, and went with the Single plane Hurricane Plus intake, added the Super Sucker plate, and produced an amazing 560 horse power at 6500 rpm with 502 lb ft of torque at 5400 rpm. Those not familiar with Pro street setups should educate themselves on the subject before choosing a cam and intake such as this. Buyers wanting decent street manners, explosive power off the line without the need for deep gearing, and with the need for a high rpm stall converter, need to stay away from this setup. Below are three more choices that will better suit your needs. On the flip side, those that want the most powerful pump gas 383 available and enjoy the thrill of a pro street setup need look no further. This setup would please the Pro street minded to a very high degree. This cam beats the ground with no mercy. Give it the right stall, gearing, and a set of ET streets in a lightweight car, and you will have that sound and feel of power with acceleration unlike any 383 has ever achieved on pump gas considering the cost. For those demanding top end power in the 550 hp + range and not wanting to sacrifice too much drivability, then I recommend building a 406 engine with the same cam setup. 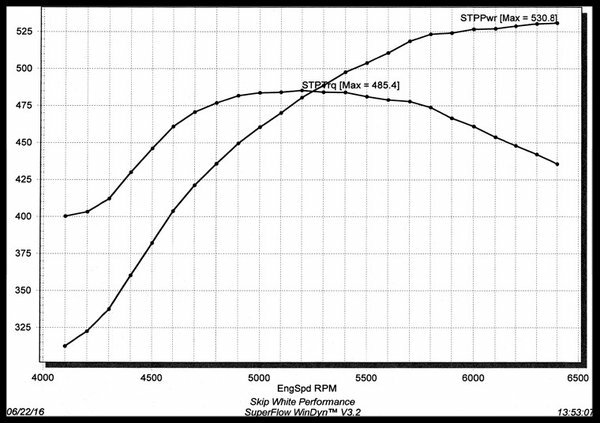 The 406 engine will move the torque band down much lower in the rpm range. PART # 180345-10 This is a hyd. roller cam for use with OE roller blocks. PART # 110345-10 This is a retro hyd. roller cam for use with non roller blocks. This cam choice (2) coupled with our single plane intake and 1.6 rockers will produce right at 530 horsepower at 6,400 rpm in a pump gas 383 engine with our NKB heads. Compression ratio would be right at 10.5:1. It must be noted that the dual plane intake will have much better drivability, and throttle response is also noticeably improved. The engine would feel stronger with the dual plane intake in the bottom and mid range. The single plane intake would have a greater impact on the hp numbers if the engine were setup in race form, as we have seen up to 20hp difference on larger cubic inch engines, and/or higher compression setups with larger heads and cam. The single plane intake is not recommended for use in vehicles weighing over 3250 lbs. Our cam timing components were left in the straight up position. Ignition timing was set at 33-34 degrees total, using 93 octane fuel. During very hot weather, total timing should be set at 31-32 degrees. This cam choice should only be used in vehicles weighing around 3,500 or less. A final gear of approx. 373 and a stall of approx. 2,800-3,200 is recommended. Below are our dyno results on one of our 406 and 383 engines with a set of our NKB heads using this cam and a single plane intake. The horse power numbers will usually improve anywhere from 5-10 more than what the dyno results show after the rings have fully seated. 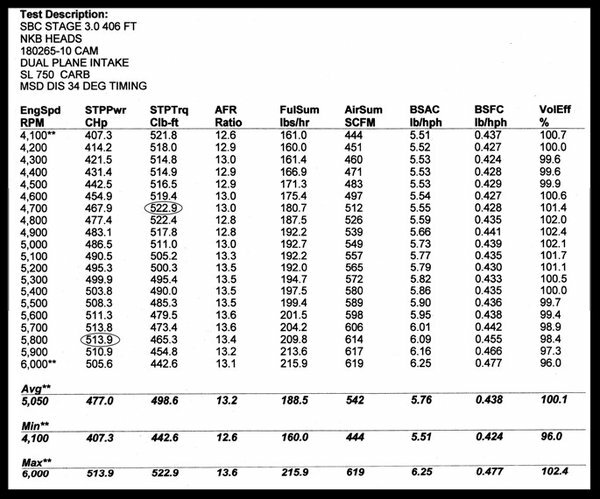 Official Dyno report on our 406 engine with this cam, flat top pistons, and a single plane intake. 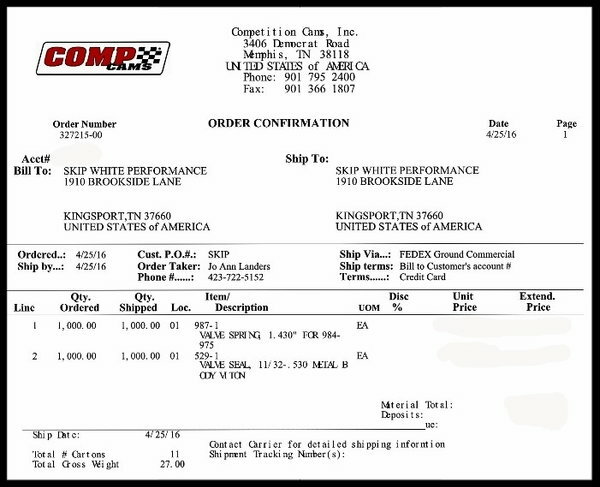 Official Dyno report on our 383 engine with this cam and a single plane intake. Cam choice # 1 and a single plane intake. PART # 180265-10 This is a hyd. roller cam for use in OE roller blocks. PART # 110265-10 This is a retro hyd. roller cam for use in non-roller blocks. This cam choice (3) is the perfect all around setup for those wanting a decent bottom and mid range, while still generating excellent power at the top in a 383 engine. This engine will use the same pistons as the cam choice above, but you could have a bit less compression ratio and that would be fine. This cam will make its peak power at approx. 5700 rpm. If your car is in the medium weight range or up to approx. 3,700 lbs, and you're wanting slightly better streetability, then this is a good cam choice. You still want to keep the final gear ratio at .323 or higher, but keeping the gear ratio on the tall side is more acceptable with this cam compared to the other choices mentioned above. You may choose 1.5 or 1.6 rockers with this cam, but we recommend the 1.5 rockers for better low end response. This cam should be paired up with the dual plane Crosswind intake for excellent daily drivability. The single plane Hurricane can be used, but the dual plane will have much better bottom end and mid range response. You can also expect a longer valve train life with this cam compared to the larger cam choices # 1 or 2. Below are our dyno results on one of our 383 engines with a set of our NKB heads using this cam and a single plane intake. The horse power numbers will usually improve anywhere from 5-10 more than what the dyno results show after the rings have fully seated. 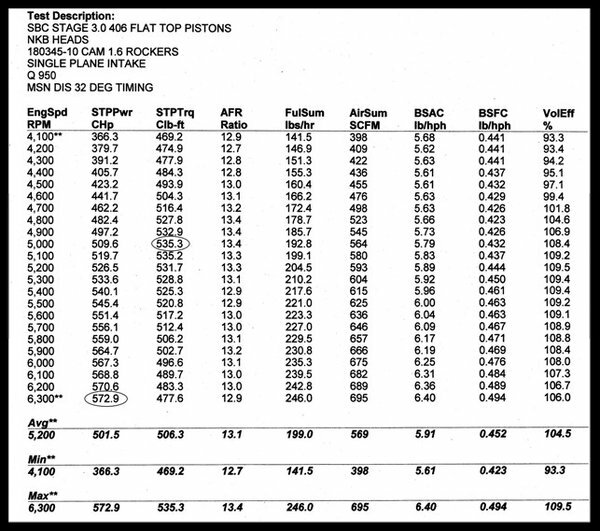 Official Dyno report on our 406 and 383 engines with the cam mentioned above. The 406 engine had a dual plane intake, yet still achieved over 500 hp with the NKB heads. Cam choice #2 and a dual plane intake. This cam and a single plane intake. PART # 180245-10 This is a roller cam for use in OE roller blocks. PART # 110245-10 This is a retro style roller cam for use in non-roller blocks. This cam choice (4) has a slightly lower lift and duration than the others offered above, and is highly recommended for use in heavy vehicles like full size sport trucks or very heavy cars. The low end response with this cam is very good. Compression ratio in a 383 could be as low as approx. 9.5:1 with this cam. Slightly higher would be recommended in a 350 build. The rule of thumb with cam size is that the smaller the cam in a given application, the more improvement in low end response. One more benefit to the smaller cam is that the requirements for lower gearing and higher rpm stall converters is reduced. A final gear ratio of 310 would be acceptable with this cam. The bottom end power would be much better with this cam than with the other choices above. This would be the only choice for those wanting to run an overdrive transmission such as the 700R4 and cruising at around 2000 rpm in overdrive. A stall converter of 2,200 would be the minimum for this cam. Valve train life is extended greatly with this cam as compared to the other choices listed above, drivability is at its best. 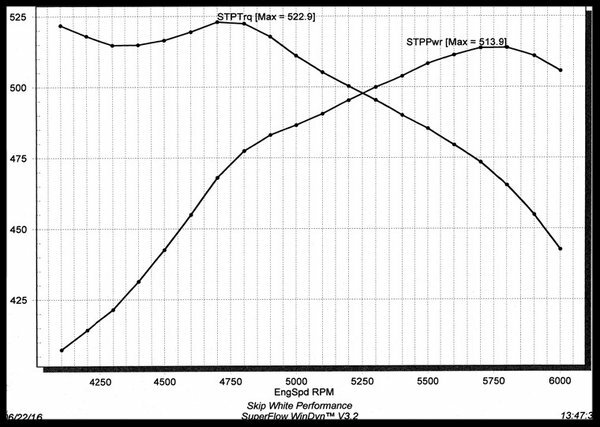 Low and mid throttle response is very strong. This cam choice will also produce the greatest amount of vacuum at idle compared to those listed above. 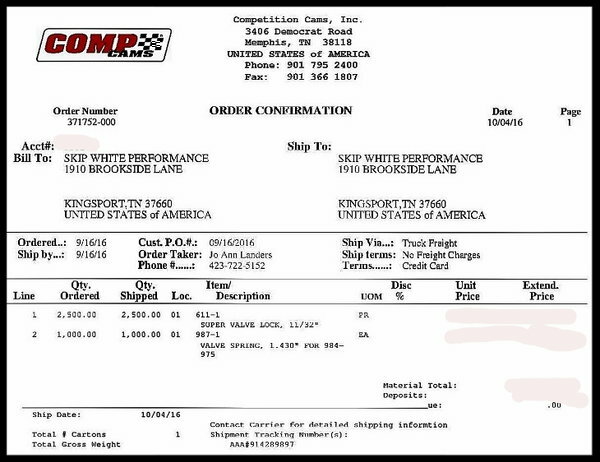 Official Dyno report on our 383 engine with our NKB heads and a single plane intake. THE CAMS LISTED WILL COVER MOST NEEDS FOR ANY STREET ROD. An excerpt from our engine ad about our new dyno. As of 9/15/2013 we completed installation of our brand new Super Flow 902S dyno. In the past, we outsourced our dyno work. We were unable to do the research and development we truly wanted, and this prompted us to make the $105,000 investment. It's been one of the best investments we have ever made. Every aspect of our engines can now be monitored, calibrated, and tuned. Best of all, we can now see what combos generate the best power, with consideration to drivability. Update, as of 3/1/16 we have installed our second new Superflo dyno. After the new dyno was setup, Superflo sent out two factory techs to calibrate it, and install the software. We made a comparison between the two dynos with one of our engines, and found them to be within one horsepower of each other. The NKB-200 heads require the use of special head bolt washers, and extended reach head bolts. Using stock length head bolts will not allow the use of the special washers required, as the OE bolts have a limited amount of thread on them. Not using the special head bolts and washers may cause serious damage to the cylinder heads. See our other listings for many of the items needed to complete your engine build. The correct part number for the head bolts to be used with these heads is 2451-W or ARP-134-3601. If you purchase the top end kit we offer for these heads, the 2451-W head bolts are included. We strongly recommend the use of the Dart guide plates with these heads, or with any aluminum heads for that matter. These guide plates will allow better rocker tip alignment due to the fact the rocker stud holes in them are oval shaped. We use them on every set of heads we install on our engines, including the Dart Platinum Pro-1's. The rocker tip may end up offset to one side more than is acceptable, and the Dart guide plates allow a decent amount of correction. The variances in stud position to valve guide alignment vary on all brands of heads. The rockers could also contribute to this issue, as the trunnion or rocker body could have variance. By having proper rocker tip alignment, you are distributing the pressure on the valve tip evenly. This not only reduces uneven valve tip wear, but also prevents undue stress on the valve guides in the heads. We recommend not using stock GM pushrods with these heads. The spring pressures on aftermarket heads are somewhat higher than on OE heads. Combine this with the larger lift and duration cams often used, and stock pushrods may flex or permanently bend. The stock pushrods are usually made from a mild 1810 steel that has been heat treated. Under high rpm they will usually flex and cause a loss of lift resulting in a power loss. The engine will usually run erratically when pushrods are flexing. 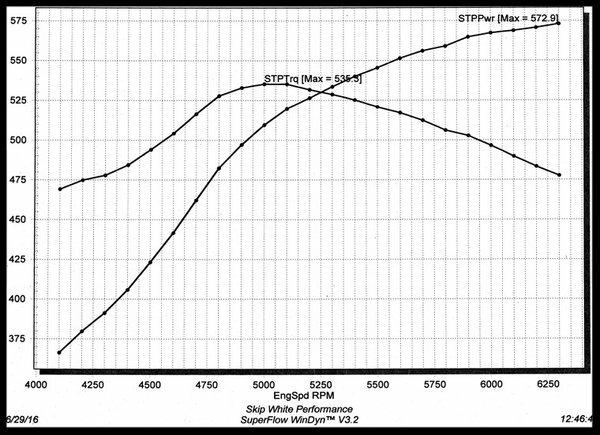 The Spintron valve train dyno proves that inadequate pushrods will flex to a great degree as engine rpm increases. Some GM pushrods have a welded ball on them, and they stand a greater chance of breaking off with the use of larger than stock cams, and increased spring pressure. We offer pushrods made from 4310 chromoly with an .080 wall thickness. They are superior to any stock pushrod. Our prices on them are the best you will find. The size that you will most likely need with the NKB heads will be 7.250. This size has worked well for us when using the Comp high energy or Scorpion brand rockers. There are many low cost pushrods on the market in the $29-$39 range. These low cost pushrods are totally unsuitable for use with these heads for the many reasons mentioned above, and they are not guide plate compatible. They usually have a wall thickness of only .065. These pushrods will cause problems when used on a high performance setup. There are many factors that can determine pushrod length requirements. The 7.250 length is the most applicable. Should you purchase a set of pushrods from us and find that the length is not suitable, you may return them, and we will send out the size you request. If you are running full roller rockers, we recommend tall valve covers, and this can cause the oil that is pumped up into the top of the heads to not be deflected back down onto the valve springs, valve tips and roller rockers. 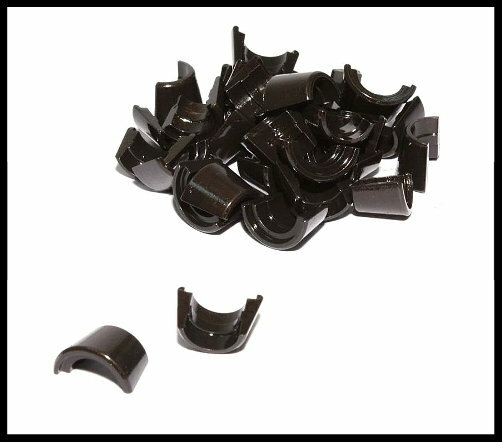 The lack of oil on these parts can lead to not only a lack of lubrication but also to a lack of cooling on these parts. Heat transfers up the valve stem from the combustion chamber. This heat is very high in temp, and may cause serious damage to the valve guides, springs and roller rockers. The cure for this would be to install a low cost set of stud girdles. Stud girdles increase stability to the rockers' studs, eliminating flex that is may be present to some degree when running cams several sizes over stock, not to mention increased spring pressures over stock. Stud flex robs your engine of power and smooth operation in the upper rpm ranges. As mentioned above, another very important aspect of using stud girdles is that they deflect oil directly back onto the valve springs, valve tips and roller rockers. On a stock engine this is not an issue due to the fact that stock valve covers are very close to the top of the rocker arms. If you have ever removed the valve covers on an engine while it is running you would notice that the oil sprays up out of the back side of the rockers and goes in all directions. The most important reason that oil is brought up into the top of the engine is for lubrication and just as importantly, to cool the valve train components. The oil temp does have a great cooling effect, as its temp is only around 215 deg. and the heat that is transferring up into the valves and springs is far greater than this. If oil were not flushed onto these parts, lack of lubrication would be just one problem. Valve guides and stems that are heated up to high temps, and also lack the proper lubrication may experience excessive wear. We suspect that these parts may be stressed due to the oil not being redirected back onto them, and stud girdles would positively protect these parts to a great degree. We now use them on every engine we build regardless of the degree of cam and spring pressure. Those running cams that are above 460 lift should use stud girdles, since this is about the level that stud flex may come in, especially when running the smaller 3/8's rocker studs. Excessive valve guide wear along with other valve train components can be very expensive to repair. Intake Port Dim: 2.2" x 1.2"
Intake Gasket: Felpro# 1206 fits perfectly with most intakes. Should your intake drop too low, then the 1266 gaskets will correct this problem. Our line of intakes have worked very well with the Felpro 1206 intake gaskets. Head Gasket: Felpro# 1003 or our line of GR-30 and GR-40 heads gaskets. Flow, Intake: See chart above. Flow, Exhaust: See chart above. Head Bolts: We strongly recommend ARP # 134-3601 head bolts. Do not use oe, (stock) head bolts. Head Studs: PC-2451-Studs (12pt) or ARP brand. Manifold: Most any. Our line of intakes fit very well on the NKB heads. Milling: Min. Down to 58.5cc or 64.5 = .060 See info in this listing for details on this. Push Rod length: When running a hyd. flat tappet cams use 7.900 length. See our other listings for the best deal on premium pushrods. Push rod Guide Plate: We strongly recommend Dart flat guide plates. See our other listings for these. Retainers/Locks: Chromoly Steel Retainers, with 10° Comp brand machined locks are used on all of our heads. Spark Plug: Straight, .750" reach, gasket, Autolite 3923 or NGK 4554 premium plugs. Springs: Melling 1.46 outer diameter. Single with a damper. Valve Stem Dia: .3415" - 11/32"
Stud Girdle: Use any standard girdle. Our Gold Series Stud Girdles work very well on these heads. Weight: 58-60 lbs fully assembled pair. These heads used on a 350 engine build will produce approx. 350-435 hp. on pump gas depending on cam, intake, rocker ratio, and carb. When combined with a 383 stroker engine, the horsepower and torque numbers increase dramatically. We have achieved 550 hp in our Stage 2.2 383 Super Stroker engine, setup for street use with the NKB heads, and able to run premium pump gas. 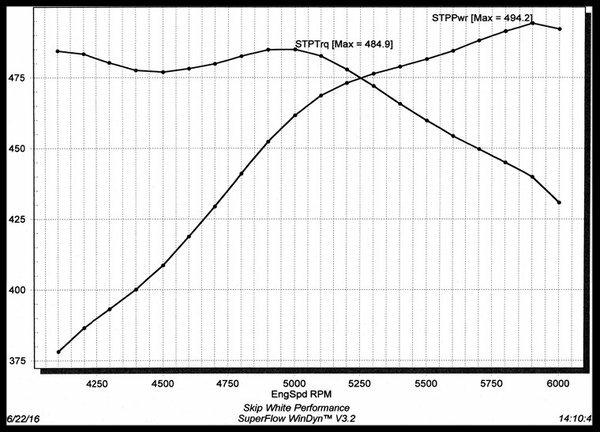 We have thoroughly tested the NKB-200 heads on our Superflo 902s Dyno. The results have been amazing with each and every cam combo possible. The above and below articles were written nearly three years ago. Most sellers do no testing whatsoever on the cylinder heads they sell. We do more than just flow testing before we market a new style cylinder head. They performed faultlessly. Cam, carb, and ignition tuning led to so much testing, and we also took the opportunity to make sure the new heads would not have any reliability issues whatsoever. Our head builder noted the excellent style of cutting on the seats in these heads. He also told us that our line of intake manifolds mounted very well on the heads, and the heads mounted perfectly onto the block. One of the worst mistakes you can make in building an engine is to mismatch parts. We know about combinations and how they work. Take a test drive in a car with over 500 hp vs. a 300 hp or less and you will then see what you're missing. The exhaust sound under load is very pleasing. These heads will generate the power you need without spending a fortune. We are very pleased with everything about these heads. When price shopping, consider the quality of hardware. Our Stage 2, 2.2, 3.0 engines are all now built using these heads. Read the full story on how these heads performed on our 383 Super Stroker pump gas engine. See our Stage 2.2 engine listing and the Stage 3.0. Our choice of hardware are what make these heads stand out compared to others. Our testing has been very thorough, and to our knowledge, none of our competitors do this. We hope you value this extra effort. We do know that many dealers are using substandard hardware and they do not have a true head builder doing the assembly or testing. Beware of sellers that offer little or no information on the hardware they use.